We know it took a lot more time than it should have, for which we are sorry, but it’s finally here! In today’s patch (Patch #2), we bring you 9 new languages: Chinese (simplified), Czech, French, German, Japanese, Polish, Russian, Slovak, and Spanish. Apart from these official languages, we also bring you the ability to write your own localization! Go to Vaporum/Localization and read the ReadMe.txt for info on how to start. We appreciate any feedback on the localization so if you find a typo, incorrect wording, or anything, feel free to tell us, and we will fix it for the next patch. In the coming days, we will also enable Steam Workshop so you will be able to upload and download localization files easily. 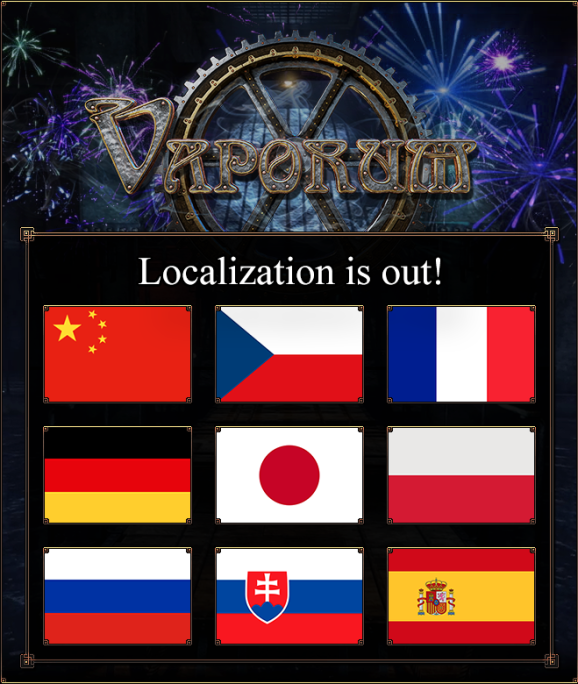 Added 9 official languages: Slovak, Czech, Russian, Polish, German, Spanish, French, Japanese, and Chinese (simplified). Added the ability to write community localizations. Head to the Localization folder and read the help file for more info. Improved organic hit sounds to sound more meaty and impactful. Added difficulty change prompt when you die a lot in a short time. Tweaked: Emergency Braces module will now also activate when you’re below the threshold when it comes off cooldown. Previously, this only activated when taking damage. Tweaked: Drainer gadgets now heal you for a portion of your max integrity, with a hard cap, instead of flat heal. Previously, you could abuse the system to get a lot more healing. Check this post for more info. Thanks motorbit! Fixed: In some cases, the automap may remain disabled even after returning from the teleport chambers in the Arx Vaporum level. Fixed: In rare cases, in the last room of Creepy Little Things, when you teleport back, the door remains closed and you cannot go back. Fixed: The chest with coal on platform in Boiling Point sometimes glitches, falling down.